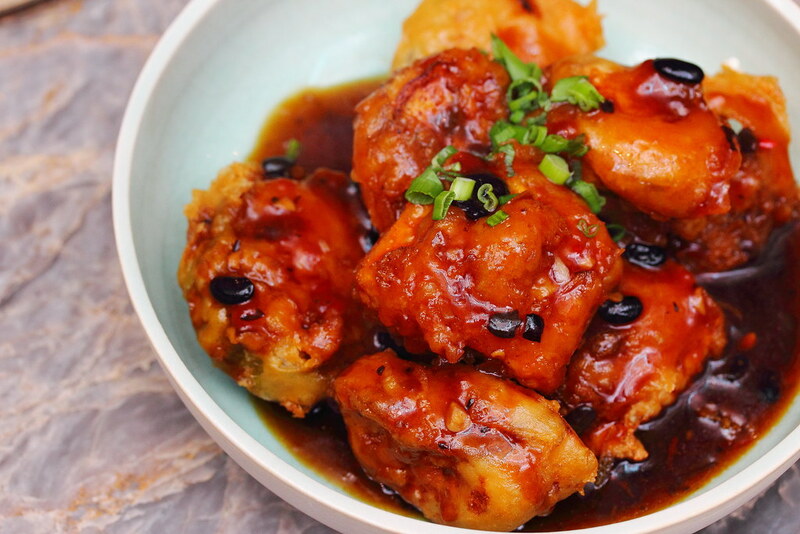 The team behind the award winning Li Bai Cantonese Restaurant has opened a new restaurant in Holland Village introducing a progressive and contemporary take on authentic Cantonese cuisine. 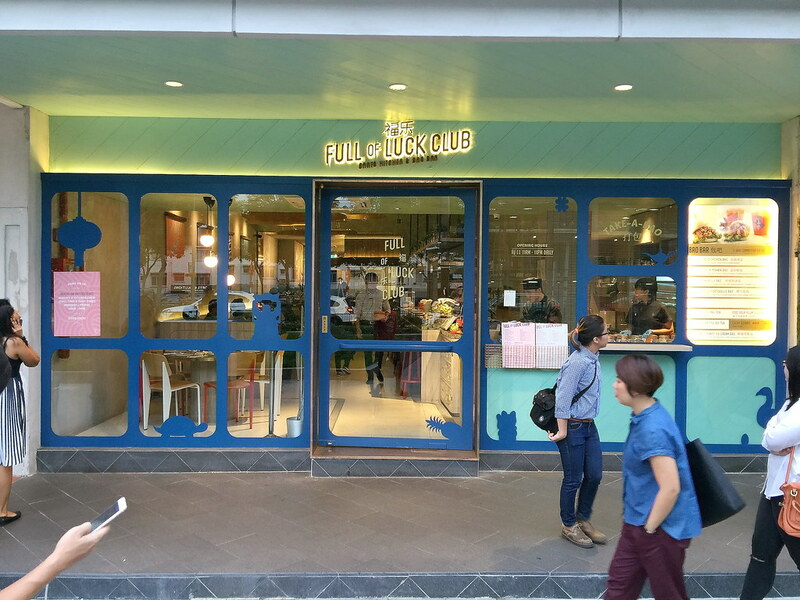 The new concept, Full of Luck Club (福乐) actually took over the premises of the former Wendy's, just next door of Crystal Jade. 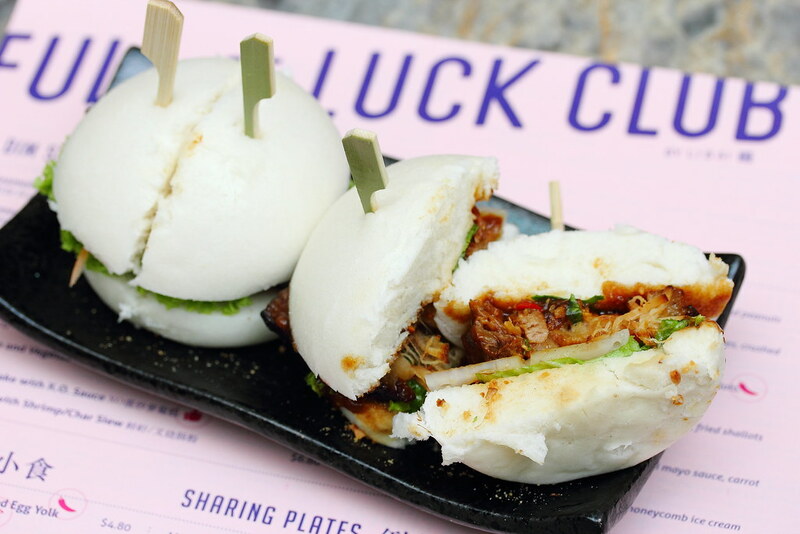 A highlight at Full of Luck Club is the Bao Bar window concept, which offers a delectable selection of both steamed and fried baos for patrons to takeaway. It is also available for dine in. As of today, a total of six choices are available on the menu such as kung pao fried chicken, salted egg yolk prawn, portuguese pork chop. For the steamed bao, I got to the Panko Crusted Portobello and Braised Pork Belly. The baos are going at $6 per piece and $9.80 for two. The bao concept is quite refreshing. It is like the Chinese's version of hamburger but replacing the bun with bao. 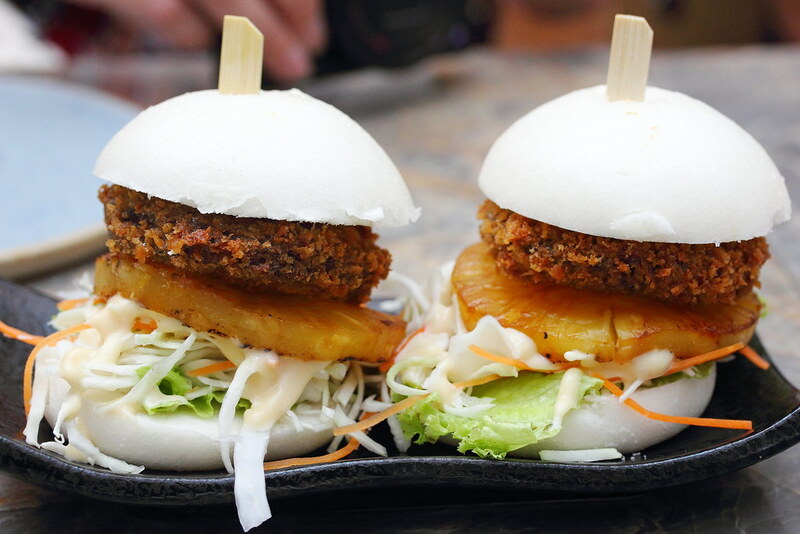 The Panko Crusted Portobello comes with fluffy steamed bao sandwiched with golden fried whole portobello mushroom in teriyaki mayo sauce, carrot cabbage slaw and grilled pineapples. The sweetness of the grilled pineapple play an important role in holding the different components together. 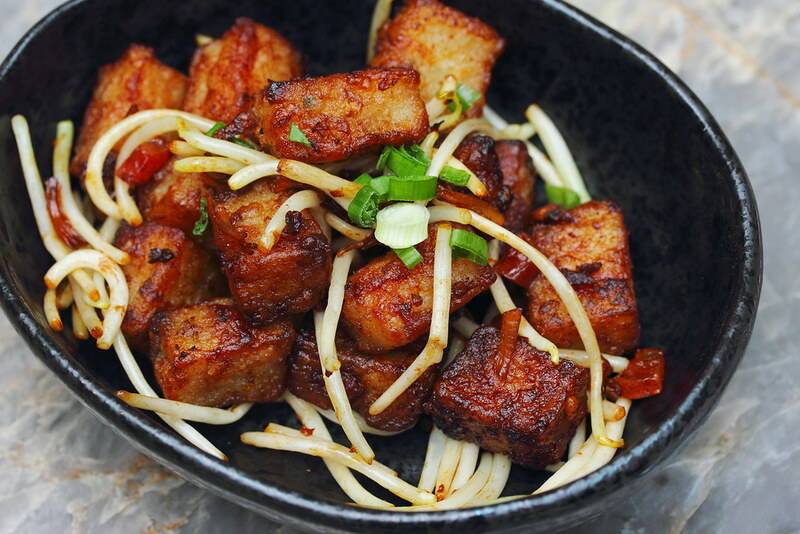 The Braised Pork Belly is like an upgraded version of kong bak pau. It comes with slow braised pork belly, lettuce, pickled lotus root, fried shallots, peanuts, coriander and bird's eye chilli. It has more textures and an extra omph from the chilli compare to the traditional kong bak pau. 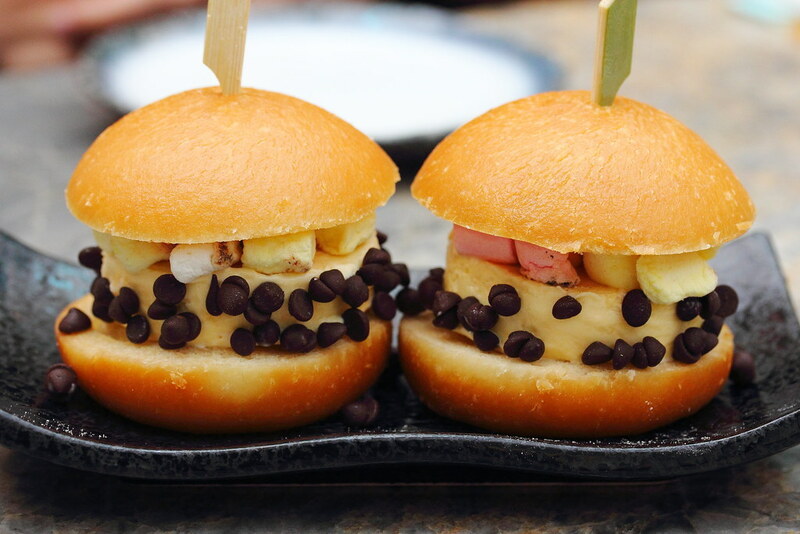 For the sweet tooth, there is the Hokey-Pokey Ice Cream which comes with cocoa chips, toasted marshmallow and creamy honeycomb ice cream in a fried bao. Surprisingly I actually quite enjoyed it except that it is a bit messy to handle. 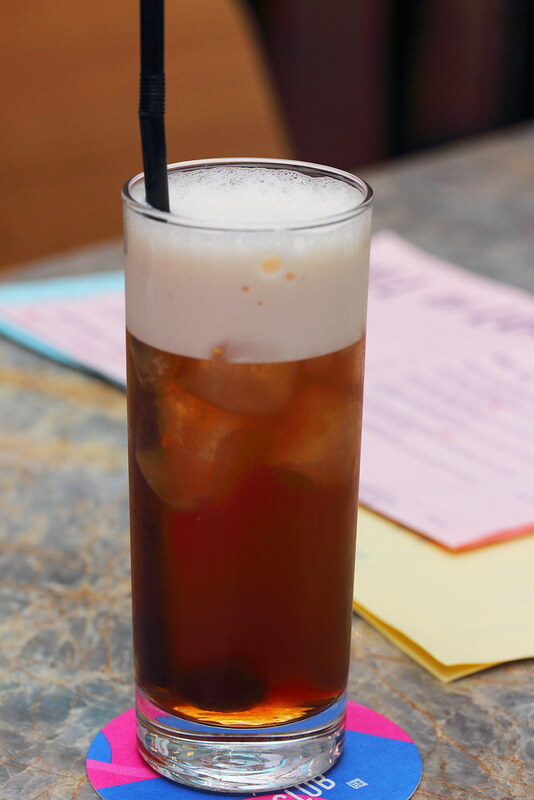 From the beverage menu, I ordered the Raspberry Pu Er ($4.50) which is light and refreshing. I like the modern twist to traditional tea drinking. The other modern iced teas on the the menu are the Lychee Oolong and Sour Plum Oolong. The Stir Fried Radish Cake with XO Sauce ($6.80) was chunky and has a nice caramelized crispy crust on the exterior. I thought the radish cake itself was rather bland, saving grace is the external seasoning that coated around it to make it delicious. To be frank, I was not too impressed with the Golden Sand Corn with Salted Egg Yolk ($4.80). 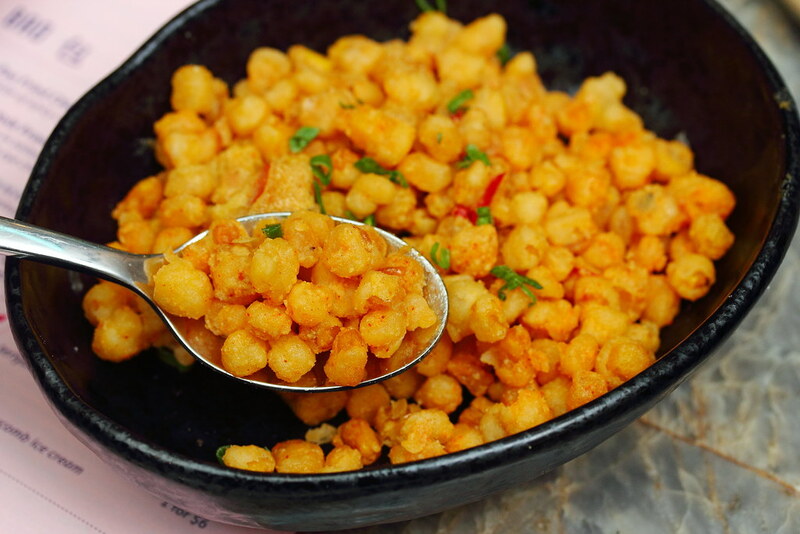 Can't deny that the corn kernels are sweet with a good crispiness from the light batter coated around it. Unfortunately, I have difficulty tracing the salted egg yolk. 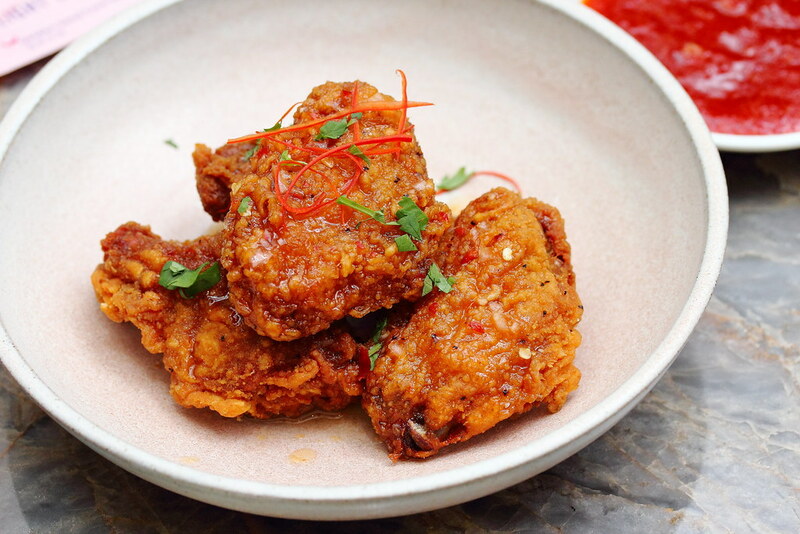 The Chilli Glazed Fried Fermented Bean Paste Chicken Wings ($8) works for me. I like the spicy and tangy kick coated on the exterior of the chicken wings on top of the juicy meat. 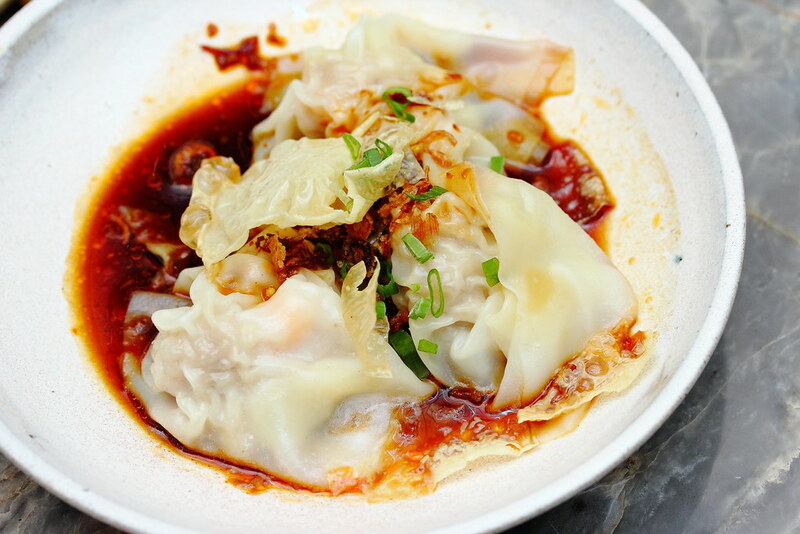 There was mixed opinions of the Poached Wontons in Chilli Soy ($7.20). I agree with the group that the wontons were good. However I felt it lacked the chilli oil aroma and spiciness which is the soul of this dish. The Braised Spinach Beancurd ($16) with its silky texture is yummy. However isn't this a classic dish, where is the progressive take on authentic Cantonese cuisine? The Spicy Stuffed Yong Tau Foo ($16) comes with assorted vegetables and tofu stuffed with minced pork. It is then seasoned with spiced whole fermented bean paste. Once again I find the spicy dishes on the menu lacking the heat that I was expecting to make me break into a sweat. The buttery flavour of the cod fish is the highlight of the Sweet Mint and Lime Cod ($24). 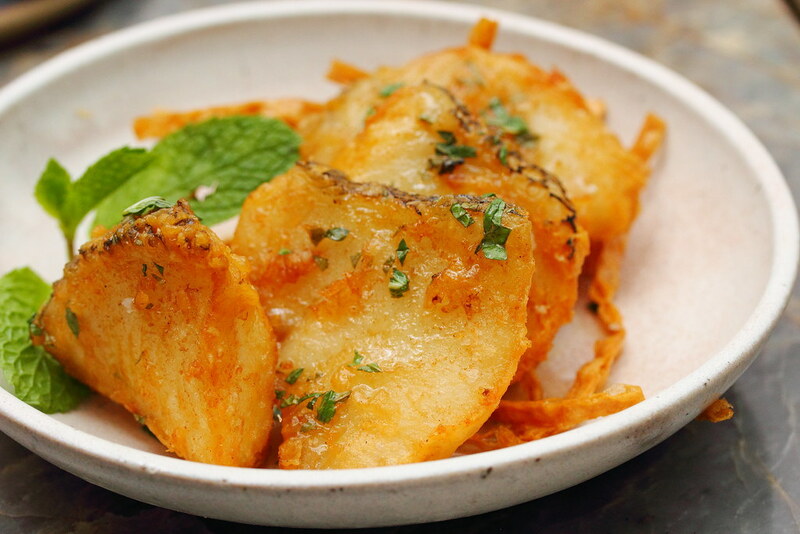 The pan seared cod is scented with mint and lime for a rounder and enhanced flavour. The cuttlefish on the other hand is rather irrelevant and not necessary for the dish. One of the signature dishes at Full of Luck Club is the Crispy Aromatic Duck ($35 half/ $70 whole). 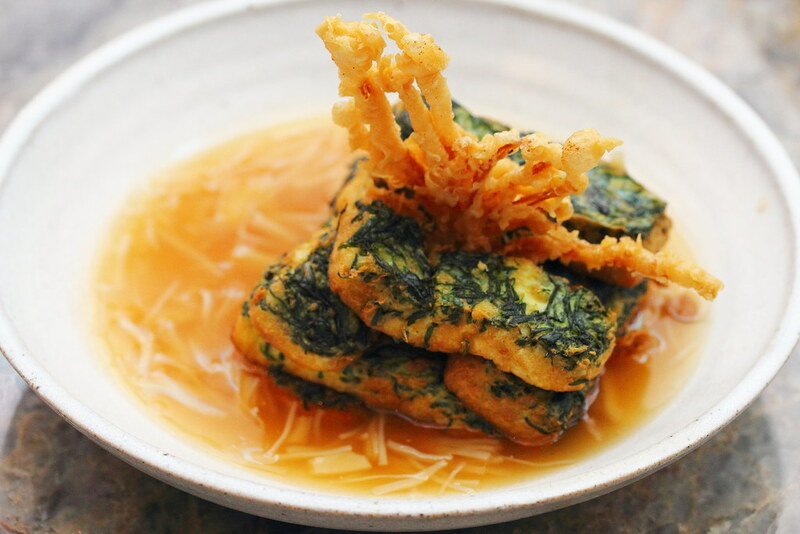 It is paired with hoisin sauce, cucumber, shredded spring onions and steamed Chinese pancakes. 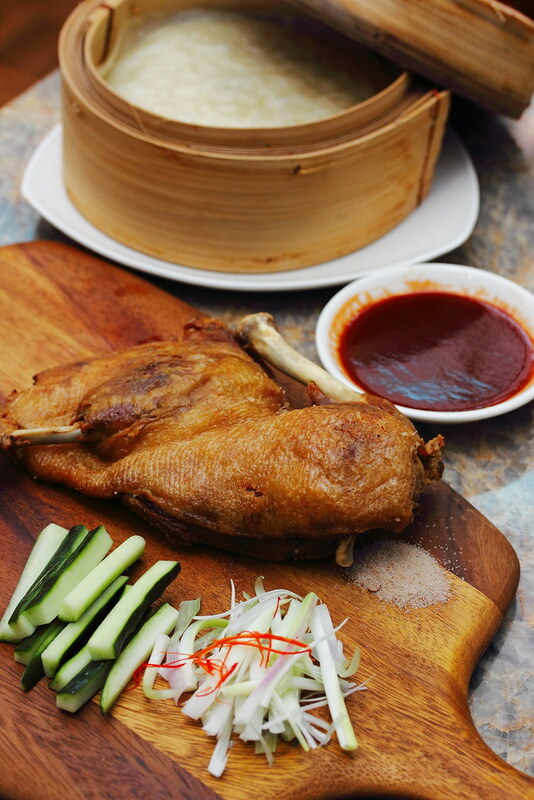 The duck is done similar like duck confit, so it can be eaten on its own or wrapped with the steamed pancakes with a bit of the hoison sauce, cucumber and spring onions. 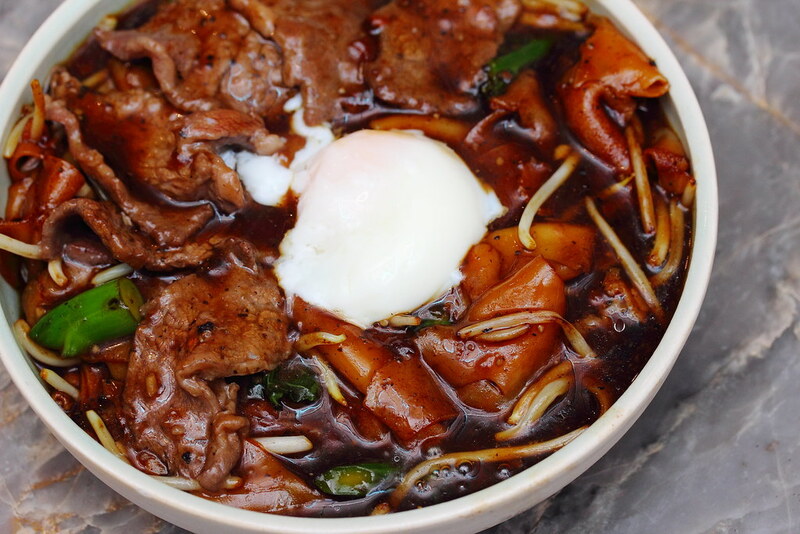 The Moonlight Truffle Beef Hor Fun ($20) will please the new gen with the addition of truffle and poached egg in the classic zi char dish. A couple of us prefer to leave out the truffle so we can get the scent of the wok hei instead of some artificial chemical. I think I will still go for KEK's version if I need a good plate of moonlight hor fun. 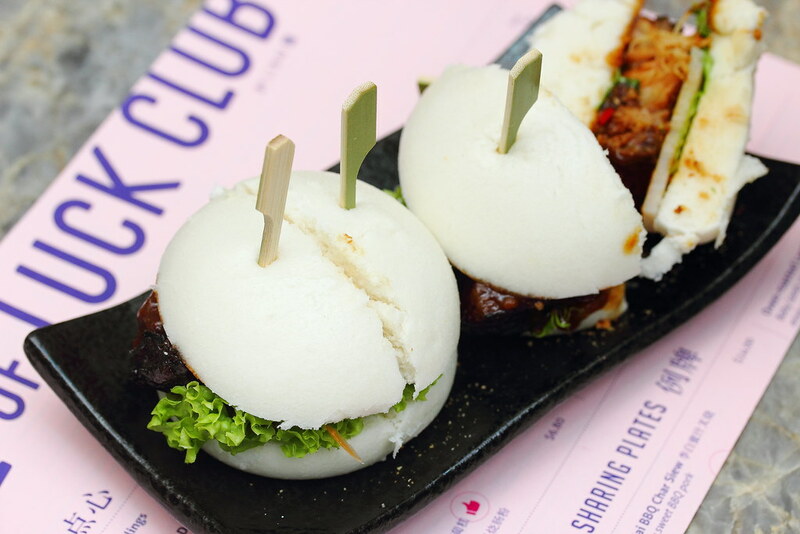 Besides the bao dishes on the menu, I am not quite impress with the rest of the items consider the team of Li Bai is behind it. I can't find much progression in the creation. It is more of tweaking authentic Cantonese cuisine to suit the taste and wallet of the new gen. Saying that I find the pricing quite steep for the quality of food it is serving. i think I will just stick to the steamed baos when I visit the restaurant again.